The Motus AX & AY by DEKA is the first, high-speed Alexandrite laser that makes it possible for even darker skin types to benefit from the effectiveness of the Alexandrite wavelength. The technological breakthrough behind the Motus AX & AY is the proprietary Moveo (Italian for move) technology, a handpiece with a cooled sapphire cylinder tip that reduces the energy loss to the skin, making the transmission more efficient and effective. Laser hair removal treatments are fast, painless and more effective for the widest range of skin types. Treatment of pigmented lesions are highly effective. Lastly, for those practices looking for a vascular solution, the Motus AY offers all the benefits of the Motus AX plus a Nd:YAG handpiece. The Motus AX & AY are manufactured by DEKA, Europe's top aesthetic laser manufacturer. The Motus AX & AY with Moveo technology was developed to overcome the limitations of traditional Alexandrite 755nm for hair removal while retaining all the advantages. The Moveo technology uses simple, even movements over specific areas, quickly removing unwanted hair due to its 20mm sapphire tip size. The repeated passes over small area (or “in-motion”) cause gradual heating of the vital parts of the hair vs. the surrounding skin. The hair follicle is destroyed in a way that is painless and safe for the patient. The energy emitted by most laser systems with visible and infrared wavelengths is largely reflected by the skin. This reduces the energy available for therapeutic purposes. The unique Moveo handpiece was designed to solve this problem enabling 100% energy absorption. This is double the energy transfer compared to standard laser machines for laser hair removal and the treatment of pigmentation. The Deka Motus AX is the fastest and only “in-motion” Alexandrite. The gradual heating eliminates the “rubber-band” sensation of most laser hair removal machines and instead treatments are comfortable and fast. The large 20mm spot size means areas be treated in less than 5 minutes. The Motus AX & AY features integrated contact cooling to add to the unmatched comfort of treatments. 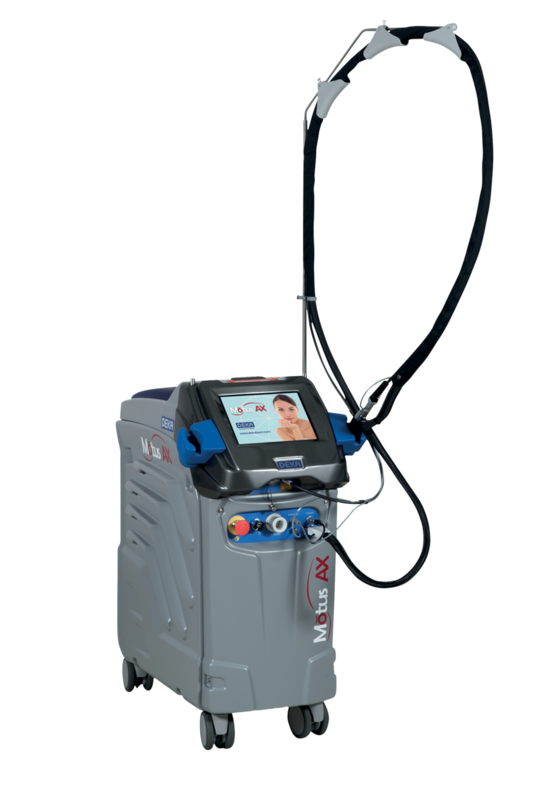 One of the revolutionary aspects of the Motus AX & AY, is the ability to offer the efficacy of Alexandrite laser technology to patients with light and darker skin types. No longer do practitioners need to settle for YAG or diode lasers for hair removal for their darker skin patients. With the Motus devices, darker skin types as well as light skin patients can achieve optimal clearance in fewer treatment sessions. This translates into more, happier patients treated. "The Motus AX has been a game changer for us. Patients can tell it is a truly cutting-edge device ... they are shocked that we can provide this therapy without any discomfort." "Motus has changed the way that we think of hair removal in our practice." "Just when you thought there was nothing new in laser hair technology, we meet the Motus AX." Interested in learning more about the Motus AX & AY?